Exchanger is a program manager for AmigaOS 4. It is part of the Enhancer Software package for AmigaOS. The name may suggest that Exchanger is a replacement for Commodore's original Exchange tool distributed as part of the Amiga operating system. This is partly true; however, the scope of usability is wider. In addition, Exchanger supports modern AmigaOS features such as jumping between screens, object-oriented menus with images, or program window snapshotting. Exchanger cannot possibly run on earlier systems because of certain Commodities Library features that were not implemented before version 53.6. Program window snapshotting and menu images will only be available when running Exchanger under AmigaOS 4.1 Final Edition or newer. The program will use the InfoWindow Class for its About window if the class is installed in the system. registered applications (managed via the Application Library). Both types supply the OS with some information about themselves, and provide a certain level of external control. For example, both commodities and registered applications can hide or show their user interface (GUI) in response to a command sent via the respective library. Similarly, a commodity or an application can shut itself down when a corresponding command is received. Exchanger aims at becoming a common control point for both program types. Closing the program window via the close gadget will NOT quit Exchanger. 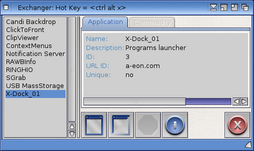 Rather, the program will be put to hidden state and run in the background, from which it can be recalled using the CX_POPKEY keyboard shortcut (see below in Configuration). The program list displays all applications and commodities currently registered in the system, in alphabetical order. By default Exchanger will not show itself in the list; this can be overridden by settings (see below in Configuration). Two or more running instances of the same registered application will show up as separate entries in the program list. The individual instances will be distinguished by their application ID in the info display. Programs that are neither commodities, nor they register with the Application Library will not appear in Exchanger's program list. If you think that a particular program would benefit from being controlled by Exchanger, please contact the author of the software in question. As commodities and applications register with slightly different information about themselves, the info display is tabbed in order to cater for both program types. The first tab is for applications, the other for commodities. Should a program register as a commodity and, at the same time, as an application (the OS technically allows this, although such implementation is rarely useful), the program name will only be shown once in the program list, and the user can switch between the tabs in the info display to see the respective information. If the program allows external control of its GUI, this button will send a command telling the respective program to bring up its GUI. 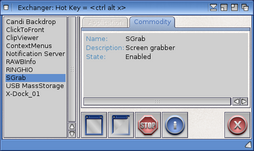 If the program allows external control of its GUI, this button will send a command telling the respective program to hide (commodities) or iconify (applications) its GUI. If the program is a commodity, this button will toggle its activation state. A disabled (inactive) commodity cannot receive input events from the Commodities Network. This button will be unavailable (ghosted) if the program is an application. If Exchanger is able to locate the selected program's icon, this button will display the Workbench information requester for the given program. Tells the selected program to quit. If a button is not available, it usually means that the particular function is not supported by the selected program. For example, commodities that have no GUI will have the Show/Hide interface buttons ghosted. If Exchanger cannot find its images at startup, it will use text-only buttons in the toolbar. Displays the program information window. Hides the program GUI completely. Iconifies the program on the Workbench screen. Show self in program list? Toggles the display of Exchanger in the program list. Toggles the display of help hints for the toolbar buttons. Stores current settings as tooltypes in the program icon. Exchanger is configured via icon tooltypes or command line parameters, depending on whether the program is started from Workbench or Shell. Some of its features can also be configured during runtime from the Settings menu. DONOTWAIT N/A If you run Exchanger from WBStartup, make sure this tooltype is in place. CX_PRIORITY CX_PRIORITY The priority of Exchanger's commodity broker (default: 0). No need to change this. CX_POPUP CX_POPUP Determines whether Exchanger should display its GUI on program startup (default: YES). If you run Exchanger from WBStartup, you'll probably want to change this to NO (the program will run hidden) and bring up the Exchanger window via the CX_POPKEY shortcut when needed. CX_POPKEY CX_POPKEY The keyboard shortcut to bring Exchanger back from hidden or iconified state (default: ctrl-alt-x). SHOWSELF SHOWSELF Determines whether Exchanger should display itself in the program list (default: NO). SHOWHINTS SHOWHINTS Determines whether Exchanger should display help hints for the toolbar buttons (default: YES). GUIIMAGES GUIIMAGES Specifies the DOS path to the images used by the program (default: PROGDIR:Images). Multiple instances of Exchanger are not allowed. An attempt to start a second instance will bring up the currently running one. The way the selected program reacts to the control commands sent by Exchanger absolutely depends on how the respective program is implemented. If a program allows external control (which should normally be the case with both commodities and registered applications), it is the responsibility of the programmer to implement it in a sensible, logical and safe way. please contact the author of the respective program. Exchanger is really just a control board which - on user request - tells other programs what to do. 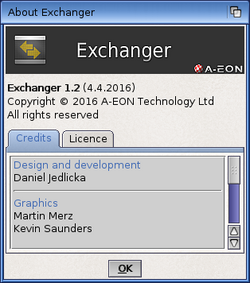 If you would like to implement or improve external control in your software so that it works better with program managers like Exchanger, please contact A-EON. You will be given all support. This page was last modified on 16 April 2016, at 19:39. This page has been accessed 58,904 times.